“I think people really have to consider their life experience before they join social work, you will be exposed to a lot of tragic situations and support very vulnerable people.” says Chris. “I’ve worked with a wide range of people including young people with psychosis, asylum seekers, victims of domestic abuse and adults with severe and enduring mental health problems. “Although I was 21 when I joined social work, I was able to use the experience of my own struggles as a teenager and young adult to provide a framework around the decisions I make and the care I provide. “My career has been such as adventure – my first job was in mental health and I fell in love with the work, every person needs different interventions and you get to be creative and flexible when delivering their care. 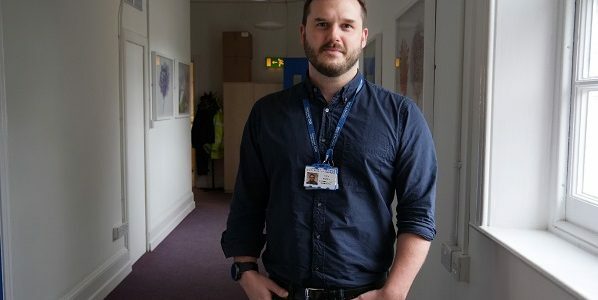 Now at just 36, he manages the Buckinghamshire early intervention in psychosis team at the Whiteleaf Centre, overseeing the treatment of people experiencing their first episode of psychosis – a mental health condition characterised by hallucinations and delusions. Even as a manager he still keeps a caseload of up to five people because he doesn’t want to lose touch with his patients. The people he works with​​ are all experiencing their first episode of psychosis and are more often patients with complex needs. Alongside his managerial responsibilities and small caseload Chris is also instrumental in setting up the peer support worker programme across the trust. Peer support workers are people from a range of backgrounds such as the police, marketing and teaching that have experienced a mental health crisis. The programme helps these people recover their confidence and rebuild their foundation b​y getting back into the world of work. The project has been a success and there are now 14 peer support workers working across Oxfordshire challenging stigma surrounding mental health and act as examples of recovery for patients who are in the midst of a mental health crisis. “Things can get better” says Chris. The project has been such a success in Oxfordshire, Chris is now setting up a team of peer support workers in Buckinghamshire. If you are interested in social work or working for Oxford Health, please visit the careers section on our website to see the latest opportunities.